MIAMI—A new study helping to improve how sustainability is measured for popular reef fish could help better assess the eco-friendly seafood options at the dinner table. A team of researchers at the University of Miami (UM) Rosenstiel School of Marine and Atmospheric Science and NOAA Fisheries tested their newly developed fishery risk assessment method on groupers and snappers in the Florida Keys to determine if these tropical reef fish are being managed sustainability. The new approach developed by UM Rosenstiel School Professor Jerald Ault and colleagues uses fish size-structured abundance data to evaluate fisheries sustainability status, instead of the traditional “catch-per-unit effort” method that requires long-term information collected by fishers to assess the health of a fishery. 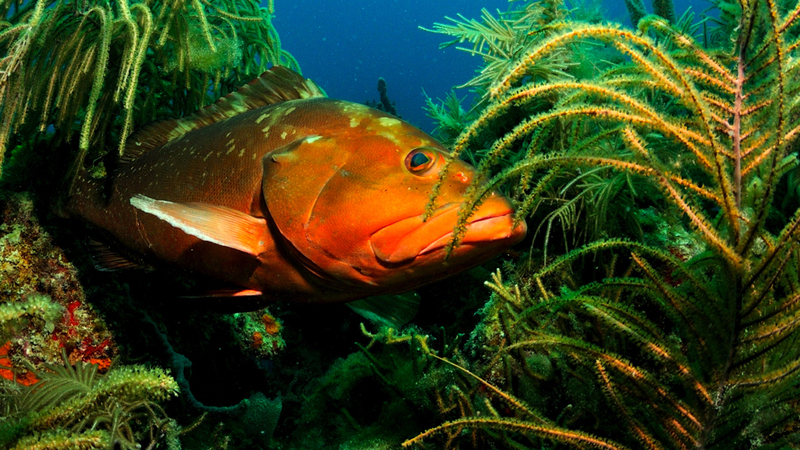 The researchers then applied the length-based assessment to six key species in the Florida Keys region—black grouper, red grouper, coney, mutton snapper, yellowtail snapper and hog snapper—to evaluate the sustainability status of the fisheries. They found that only one species—coney—was within the sustainable range with a less than a 35 percent risk score. The other five species had estimated sustainability risks of greater than 95 percent. While the focus of this study was to develop a general length-based risk analysis methodology appropriate for data-limited fisheries worldwide, says the researchers, the results of the sustainability risk assessment for the species evaluated were in line with previous analyses for reef fishes in the Florida Keys and surrounding regions. The new risk analysis framework can evaluate the sustainability status of tropical reef fish stocks when traditional catch data are not reliable or available and provide a frame of reference to help balance sustainability risks with management decisions. In a separate but related study, Ault and colleagues developed a new fisheries-independent ecosystem monitoring survey to estimate biomass of deepwater snappers in the Hawaiian Islands. This new survey provides critical data for the risk analysis framework to assess fisheries sustainability in Hawaii. The new methods developed are designed to ensure the quality of commercial and recreational fishing today and into the future, said Ault. The study, titled “Length-based risk analysis for assessing sustainability of data-limited tropical reef fisheries,” was published in the journal ICES Journal of Marine Science. The coauthors include: Jerald Ault, Steven Smith, Jiangang Luo and Molly Stevens from the UM Rosenstiel School; and James Bohnsack, Matthew Johnson, David Bryan and Gerald DiNardo from NOAA Fisheries. The study, titled “Towards fishery-independent biomass estimation for Hawaiian Islands deepwater snappers,” was published in the journal Fisheries Research. The coauthors include: Jerald Ault and Steven Smith from the UM Rosenstiel School; Benjamin Richards, Annie Yau, Brian J. Langseth, Joseph M. O’Malley, Christofer Boggs, Michael Seki, and Gerard DiNardo from NOAA Fisheries. The studies were supported by NOAA Southeast Fisheries Science Center and Coral Reef Conservation Program (Grant # NA15OAR4320064-SUB36), National Park Service (Grant # H5000105040-PA15AC01547-PA16AC01758- P15AC012441-P16AC01758), Florida RESTORE Act Center of Excellence (Grant # FIO-4710112600B) and NOAA Pacific Islands Fisheries Science Center (Grant # AB-133F-17-CN-0103, AB-133F-10-CN-0312, WE-133F-15-SE-1360, WE-133F-16-SE-1408).